Nancy Becker shows new hot sculpted glass at Tumalo Art Co. 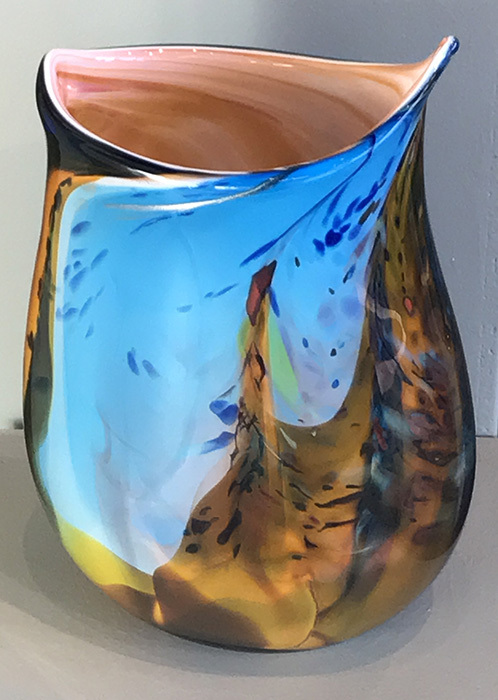 In May Tumalo Art Co. features award-winning glass artist Nancy Becker with glass pieces inspired by water, sky and shore. Her show “Portraits of the River” opens May 5, from 4-8pm during the First Friday Gallery Walk and includes new vessel forms and loose open bowl forms. Nancy’s lustrous, organic pieces are hand-blown or hot sculpted glass, using a layering process of hot glass that achieves a painterly result. Rich, pure color mixes with flowing form creating glass pieces that are inspired by her deep connection to nature. Utilizing the fluidity of molten glass to recreate the flowing motion of water, Nancy communicates the symbiosis of the river with everything it touches. Along with the river themed glass work, Susan Luckey Higdon will be giving a sneak peak of “The Source”, the original signature art for the 2017 Deschutes River Conservancy’s RiverFeast event, previous to it being auctioned May 6. Tumalo Art Co. is an artist-run gallery in the heart of the Old Mill District open 7 days a week. www.tumaloartco. ; 541-385-9144.